Much of the work to date on dataflow models for signal processing system design has focused on decidable dataflow models. 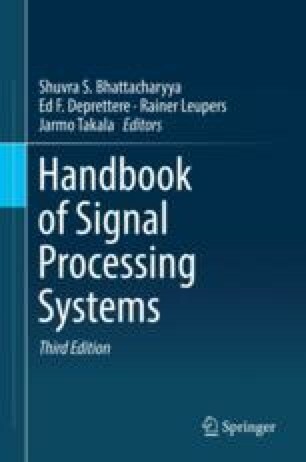 This chapter reviews more general dataflow modeling techniques targeted to applications that include dynamic dataflow behavior. The complexity in such applications demands for increased degrees of agility and flexibility in dataflow models. With the application of dataflow techniques addressing these challenges, interest in classes of more general dataflow models has risen correspondingly. We first provide a motivation for dynamic dataflow models of computation, and review a number of specific methods that have emerged in this class of models. The dynamic dataflow models covered in this chapter are Boolean Dataflow, CAL, Parameterized Dataflow, Enable-Invoke Dataflow, Scenario-Aware Dataflow, and Dynamic Polyhedral Process Networks. In this work, Bhattacharyya has been supported in part by the US Air Force Office of Scientific Research. The authors also thank Marc Geilen (m.c.w.geilen@tue.nl) and Sander Stuijk (s.stuijk@tue.nl), both from the Eindhoven University of Technology, for their contribution to Sect. 6.